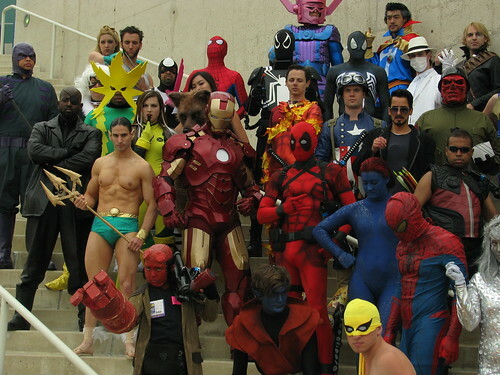 A group picture of the Marvel cosplay meet-up. 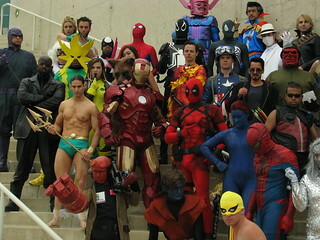 Included in this picture are the following characters: Galactus, Doctor Strange, Viper, Wolverine, Spider-Man, Venom, Doctor Nemesis, Longshot, The Wrecker, Black Cat, Bullseye, Psylocke, Human Torch, Captain America, Red Skull, Nick Fury, Electro, Rogue, Werewolf By Night, Namor, Iron Man, Deadpool, Hawkeye, Mystique, Nightcrawler, Iron Fist, and Emma Frost. And Hellboy, who isn't a Marvel character.